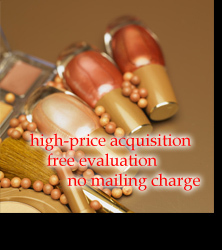 Perfume and cosmetics acquisition at a high price! Price evaluation with free mailing charge. Testers, samples, defectives, secondhand or refused products are all open to consultation! Substandard stock and large-volume acquisition are also welcome. Ｃosmetic or perfume that is used halfway. Change to other cosmetics because of skin problem. the following products are for your reference. For other products, please call for consultation. Refused and secondhand products are also open to consultation. Satisfying price! We will be responsible for all mailing and transfer charges. Acquisition of new and secondhand cosmetics abroad or at home. Samples and testers are also welcome! Acquisition of new and secondhand perfume. Old ones are also accepted. Mini-sized perfume and testers are also welcome! Please call for consultation in that the status of products varies. On-site store consultation is available. Chinese service available. Please email us for price evaluation.